Venue: Copenhagen Business School, Råvarebygningen, Porcelænshaven 22, Frederiksberg. 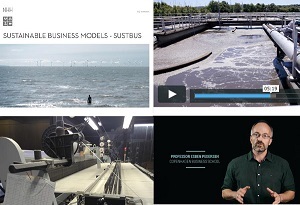 The Erasmus+ Project Sustainable Business Models has developed an educational program on Sustainable Business Models consisting of five online modules. The program has been developed by Copenhagen Business School in collaboration with the Norwegian School of Economics (NHH) and ESADE (the Ramon Llull University). business models upon which it is based. Business cases will be presented by KLS Pure Print and Skagerak and the seminar will conclude with a panel debate focusing on means of implementation and development in theory and practice. SUSTBUS seminar - program and practical information. Contact: Esben Rahbek Gjerdrum Pedersen, ergp.msc@cbs.dk.